A fan tying to meme the situation..!!! What we intend to say that there could be a one tiny possibility that Miss India refused for some genuine reason that Rathi misunderstood and blabbered to her mentor, but Ines should have gone in-depth before posting such controversial statement [You are not just a Gossip provider…right? ], that too when she is indirectly linked with this year’s Miss Universe as she is a mentor of Singapore. This actually may put Miss Singapore in a bad light that she is passing on all the gossips to Ines Ligron, who in turn is copying and pasting on her page..!! 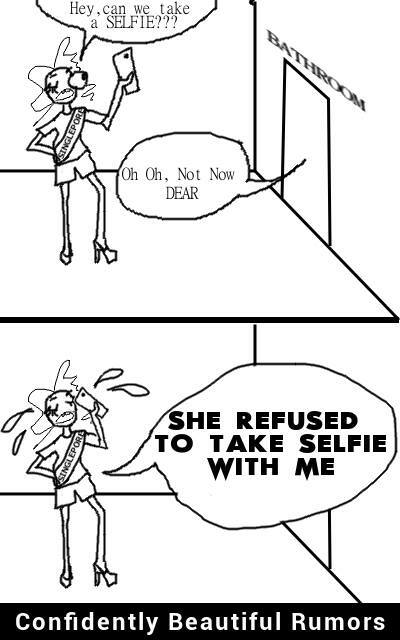 1) Miss India was not actually ready for pictures, may be no make up ? 2) Miss India was busy in some work or was in a hurry that she politely denied Miss Singapore? 3) May be Miss India and Miss Singapore don’t go well together? And either Miss India said no because of that; after all not all the 70++ girls will be nice to all other 70++ girls or Miss Singapore just made up that news. 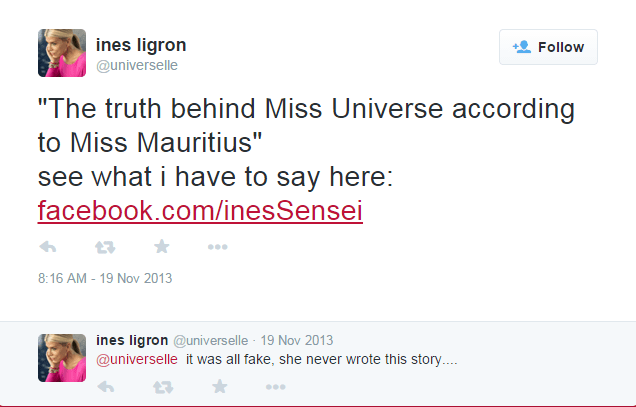 Ines’s reply to Miss Mauritius 2013 for the message actually posted by Miss Mauritius 2012 on the process of selection at Miss Universe 2012. Ines did have some valid points but not the gentle way of conveying it and that too an assumption on who posted that message. She should be careful in making such nasty status, otherwise it looks as if she is just hungry for attention or insecure of some front-runners who has a better chance of winning than her own trained girl. Although, she did apologize later to Miss Mauritius 2013, the damage was already made where she commented on personal ability of Miss Mauritius by openly saying that she was not a Miss Universe material. You can not just speak anything on the name of ‘FREEDOM OF SPEECH. Do you think Ines needs to be careful before posting such statuses? or she has all rights to post whatever she wants on her page?